An incessant torrential downpour has ravaged Tbilisi, resulting in flooding of low-lying areas in Georgia’s capital. The severe weather took the lives of 12 people and resulted in the deaths of 300 animals from the local zoo. The death toll so far stands at 12, while 24 people are missing, TASS reports. Bodies were found mostly in flooded private households. There have been reports of landslides in Tbilisi’s suburbs. The Georgian PM announced June 15 to be a day of mourning for the Tbilisi flood victims. The water has filled hundreds of basements, underground walkways, squares and roads, and damaged electrical and technical infrastructure. The House of Justice has suffered the most among the federal buildings. Some 22,000 Tbilisi citizens remain without electricity. Prague Zoo along with other Czech zoos is set to send a team of at least five specialists to Tbilisi on Monday. "The situation is rather difficult. We haven't seen anything like this in the capital before," Garibashvili said. The Georgian PM reported that rescuers and police are doing their job well and have already saved dozens of people. "All problems will be solved," Garibashvili promised. Three people were found dead in the zoo’s grounds. Out of a total of 17 penguins housed in the Zoo only three survived. Some creatures are now roaming the streets of Tbilisi. SWAT teams are trying to catch them using tranquilizer darts where possible, but they have killed some that became aggressive because of the disaster, including six wolves cornered near a children's hospital, Interfax reported. Two lions and a tiger have reportedly been shot dead. The number of the dead animals was reported by the administration of the Tbilisi zoo, according to RIA-Novosti. 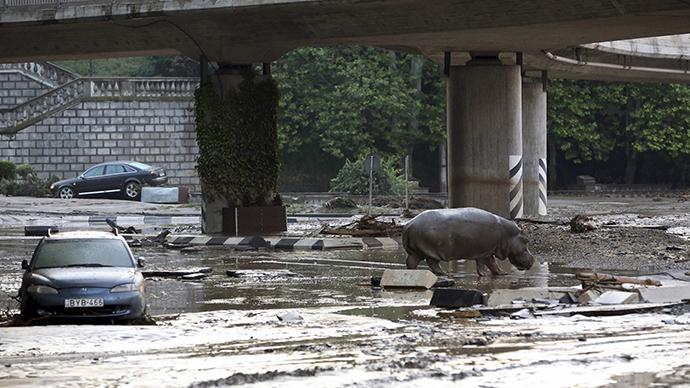 “There were over 600 inhabitants in the zoo, and over a half of them haven’t survived. A part of the runaway animals is killed, a part is transferred to a special safe place. Bailing operations are being conducted at the moment,” a spokesperson for the zoo administration told reporters. Zoo director, Zurab Gurielidze, believes that some runaway animals were killed without any special need. A rare white lion Shumba was found gunned down on the territory of the zoo. “In the case of a predator attacking a man, its liquidation is understandable. But many things have to be explained. I know for sure that there has been no ruling to kill, some people seem to have exceeded the authority,” Gurielidze said, as cited by RIA-Novosti. Loss from the flooding in Tbilisi is estimated at about $23 million, according to the Prime Minister of Georgia, Irakli Garibashvili. He also confirmed that twelve people have died and 24 were missing.